Rush guitarist Alex Lifeson is sharing an update on the band’s status in a new interview with The Globe And Mail. Following a 2013 induction into the Rock And Roll Hall Of Fame, Rush performed the final show of their 40th anniversary R40 Live tour at The Forum in Los Angeles on August 1, 2015, leaving fans to wonder if the Canadian rock legends would return at some point in the future. 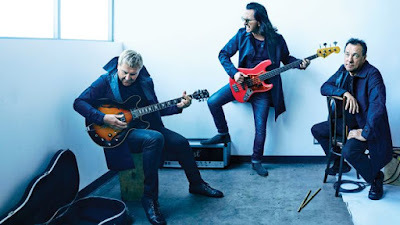 “It's been a little over two years since Rush last toured,” explains Lifeson. “We have no plans to tour or record any more. We're basically done. After 41 years, we felt it was enough. Lifeson will appear on Fu Manchu's new album, “Clone Of The Universe”, which is due next month; the rocker is featured on an epic 18-minute track called "Il Mostro Atomico." Rush formed in 1968 in Toronto’s Willowdale neighborhood when Lifeson started a high school band that eventually included his classmate, Geddy Lee, on vocals, bass and keyboards; drummer Neil Peart, from St. Catharines, ON, joined the group in 1974.